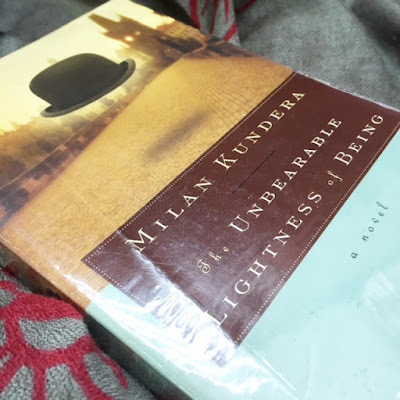 I've heard many things about The Unbearable Lightness of Being but I've always shied away from it. I remember a time when I browsed a copy and got intimidated by the first chapter, which talked of philosophical stuff. I obtained my copy from a book club friend during our club's Christmas exchange gift some 2-3 years ago, and since then, it had always sat on my shelf, begging to be picked up. Thankfully, I have a bingo square for "Philosophical Fiction" so this time around, no more excuses reading this book. Contrary to my initial perception, the novel isn't all about philosophy. Of course, Nietzsche was mentioned, there's stuff about past and future lives, lightness and being, heavy stuff. But there was also the story of Tomas, his wife Tereza, Tomas's mistress (among many) Sabina, and Sabina's lover Franz. Also, there were underlying political themes in the novel, regarding Russia's occupation of Prague. It was deftly interwoven into the story of the main characters, which I appreciated. At the core of the story is Tomas, a sought-after surgeon in Prague, and a womanizer. He had a wife and a son, both of whom he no longer cared about. He can no longer keep track of the women he's been with. By some serendipitous twist of fate, Tereza and her suitcase come into his life. The words "babe in a bulrush basket" were mentioned one too many times in the novel to describe how Tereza came into his life that until now, I still remember them. Tomas felt that he had the obligation to take care of Tereza - who literally fell ill that first night she spent in his house - and he allowed her not just into his home but into his life. They married, but Tomas could not give up his mistresses, especially not Sabina. Sabina is an entirely different character altogether. She thrives in betrayal and is turned off by loyalty; perhaps that was why being Tomas's mistress was an arrangement that worked for her and other people's loyalty to her caused her to drift away. Her personal experiences and ideologies dictated her decisions a lot, and affected her relationships in a major way. But she was headstrong, and firm. I liked her character. The character I least liked was Tereza, whose faithfulness was admirable but much too much for my taste. She was loyal to the point of martyrdom, really. I felt like she was too fragile, like she needed someone to be taking care of her all the time. And she was exactly what Tomas needed. The relationships between and among the characters were very engaging, and I loved it. I will not claim to fully grasp each and every philosophical idea mentioned in the novel, but the context in which they were used to describe these human relationships allowed me to more than just scratch the surface, and that's enough. Combine that with beautiful writing, albeit translated, and this is a novel worth your while. "Love is the longing for the half of ourselves we have lost." I didn't like this book when I read it few years back because ugh it was just heavy. I've read a few other philosophical novels afterwards and I think I might be able to appreciate Milan Kundera now but a reread looks tedious haha!